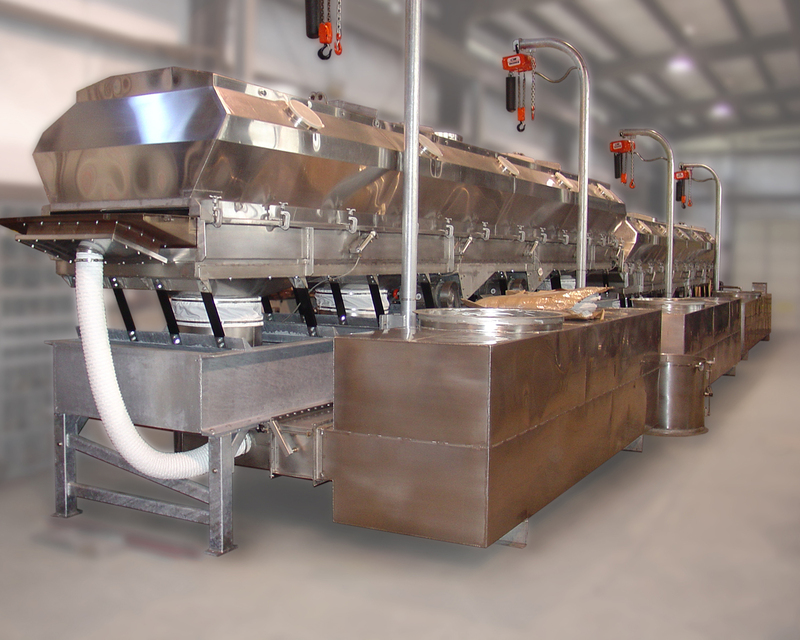 Washington, NJ: The Witte Company successfully completed the construction of a 60 foot long vibrating fluid bed dryer/cooler for Fiesta Brands Inc in the Philippines. The client came to the Witte Company looking to dry 6,450 pounds an hour of wet desiccated coconut, with up to 58% moisture content @ 80 º C, down to 3 % moisture content and 50º C before discharging the product. Laboratory tests were performed at Washington, NJ where Witte was able to simulate the operation on scaled down production equipment to find out necessary product parameters. From this information and constant feedback from the client, Witte was able to accurately engineer and build a complete system that met all requirements. Air exhaust system capable of recycling 40 % of supplied air.